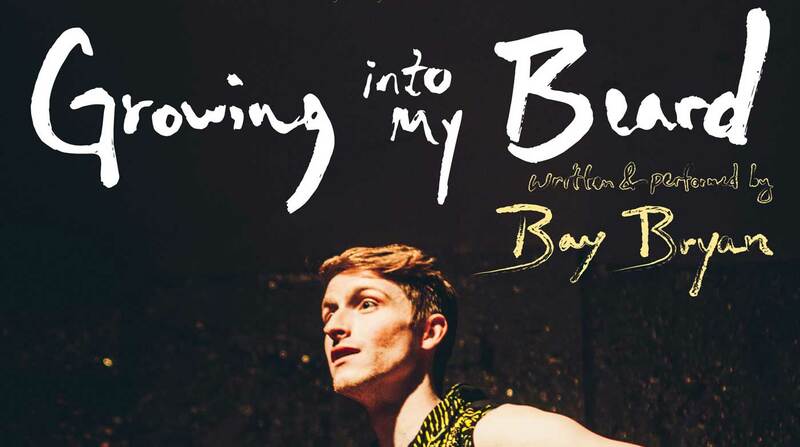 Performance artist and singer/songwriter Bay Bryan is incredibly excited to bring his solo show ‘Growing Into My Beard’ back to Interplay Theatre! One year older and hardly any wiser, Bay brings a fresh spin to this constantly evolving script. With clever direction from Claire-Marie Seddon this duo bring to life a story that is both deeply personal and queerly familiar. At the heart of ‘Growing Into My Beard’ is one ginger’s personal quest to obtain TRUE LOVE –the kind that can ALWAYS be found in the movies starring Drew Barrymore (love you Drew)… By way of original songs, dramatically told personal anecdotes and justified farcical movement, Bay weaves together a coming-of-age tale that is romantically nostalgic, profoundly authentic and above all HOPEFUL. The first rendition of “Growing into My Beard” debuted in the East Village, NYC at Under St Marks Theater in May of 2015. This was a launching point for a Festival tour that would see the piece at the Minnesota Fringe Festival in August, and then the Philly Fringe Festival in September with warm reception from both festivals. Then in 2016 it went on to enjoy successful runs at the One Catches Light Festival in Brooklyn as well as the Proud AF Solo Festival at The Tank in NYC. Most recently GIMB played at Shine in Boulder, CO (July 2017) and Interplay Theatre in Leeds, UK before that (December 2016). Bay Bryan is a singer/songwriter and performance artist originally from Golden, CO. His music can be described as a fusion of folk/soul/theatrical-pop with vocals likened to artists such as Laura Marling, Jeff Buckley and John Legend. You can find his music on iTunes, Bandcamp & Spotify. From writing/performing his own music, to touring ‘Growing into My Beard,’ to composing music for the award-winning animation The Walker (by Heather Collins; Produced by Matt Groening), Bay’s ultimate passion lies in story. He wants to tell the exceptional ones, and he wants to tell them well.